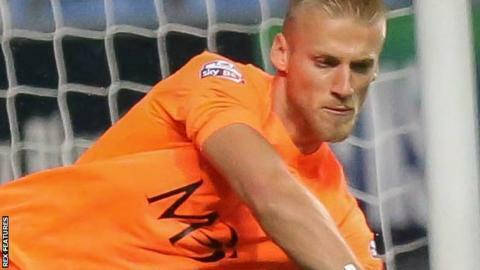 Daniel Bentley's stoppage time penalty save helped Southend halt their slump by claiming a point at Peterborough. The Shrimpers keeper pulled off a fine stop to keep out Chris Forrester's penalty after Posh substitute Marcus Maddison had gone down in the box. Bentley had also impressed when tipping over from Erhun Oztumer before keeping out a Lee Angol header. Southend also had a chance to nick victory when Jack Payne dragged wide and Tyrone Barnett steered a shot over. The draw nevertheless brought to an end a run of three consecutive defeats for Phil Brown's visitors, leaving them three points off the final League One play-off spot that is occupied by Peterborough. Match ends, Peterborough United 0, Southend United 0. Second Half ends, Peterborough United 0, Southend United 0. Attempt blocked. Noel Hunt (Southend United) right footed shot from the centre of the box is blocked. Corner, Southend United. Conceded by Ricardo Santos. Substitution, Southend United. David Mooney replaces Jack Payne. Penalty saved! Chris Forrester (Peterborough United) fails to capitalise on this great opportunity, right footed shot saved in the top right corner. Penalty conceded by Stephen Hendrie (Southend United) after a foul in the penalty area. Corner, Peterborough United. Conceded by Adam Barrett. Substitution, Southend United. Noel Hunt replaces Tyrone Barnett. Attempt missed. Tyrone Barnett (Southend United) left footed shot from the centre of the box is too high. Attempt missed. Luke O'Neill (Southend United) right footed shot from the left side of the box is close, but misses to the right. Substitution, Peterborough United. Kgosi Ntlhe replaces Lawrie Wilson. Attempt missed. Ryan Leonard (Southend United) left footed shot from outside the box misses to the left. Attempt blocked. Tyrone Barnett (Southend United) right footed shot from outside the box is blocked. Will Atkinson (Southend United) wins a free kick on the right wing. Attempt missed. Ryan Leonard (Southend United) right footed shot from outside the box is close, but misses to the right. Substitution, Peterborough United. Marcus Maddison replaces Lee Angol. Attempt missed. Erhun Oztumer (Peterborough United) right footed shot from outside the box is too high. Attempt saved. Chris Forrester (Peterborough United) right footed shot from outside the box is saved in the centre of the goal. Corner, Peterborough United. Conceded by Adam Thompson. Attempt blocked. Jon Taylor (Peterborough United) left footed shot from the centre of the box is blocked. Attempt missed. Tyrone Barnett (Southend United) header from the centre of the box is close, but misses to the left. Corner, Southend United. Conceded by Chris Forrester. Attempt blocked. Jack Payne (Southend United) right footed shot from the left side of the box is blocked.